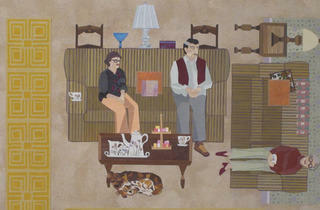 Toebbe’s paintings of domestic interiors evolve. Photograph: Courtesy of ebersmoore Ann Toebbe, The Pastor Visits, 2013. When Dorothy and Jessie—unmarried sisters who had been friends with Ann Toebbe’s family for decades—died in 2007, in their nineties, they set off a poisonous dispute that simmers under the surfaces of the Chicago artist’s eight new mixed-media paintings. According to the exhibition statement, the sisters had promised to leave portions of their then-valuable Proctor & Gamble stock to their pastor, their handyman, a fellow parishioner named Loreaux—and Toebbe’s parents. But when Dorothy and Jessie died, Loreaux sued their estate, hoping to win a larger inheritance. His lawsuit and the stock-market crash ruined the sisters’ fortune and derailed Toebbe’s parents’ retirement plans. Without knowing this history, viewers can’t grasp precisely what’s happening in Toebbe’s domestic interiors, but the paintings fascinate nonetheless. 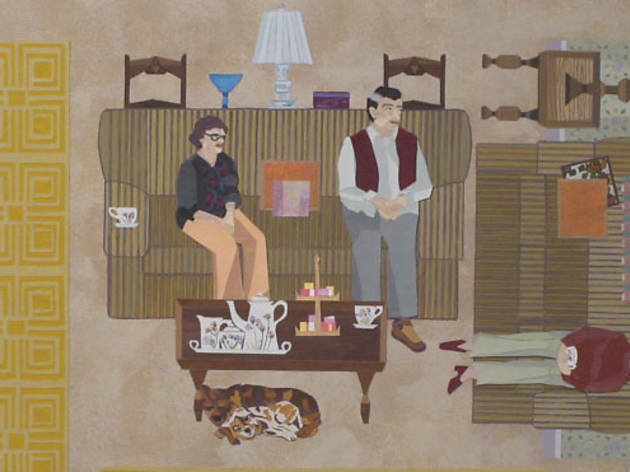 The artist reveals the complexity in drab Midwestern living rooms by representing them from multiple perspectives at once, a hallmark of her work. She also introduces human figures, a significant shift in her practice. These subjects are the major players in the inheritance battle. Toebbe reveals their identities through meticulous details executed in cut paper, fabric and other materials, as well as through the paintings’ titles. Loreaux, squeezed into a suit, and his wife, who sits on a plush red sofa, ooze self-satisfaction. Tiny Christmas decorations adorn what appears to be Toebbe’s parents’ home in happier times. Given the precision with which she renders each interior, it’s no surprise to learn the artist relied on family snapshots. Her scenes of people chatting—or gazing impassively at the viewer—have an unreal quality, however, as though they take place on stage sets. Toebbe’s sources also include a dollhouse museum and her mother’s memories of this family drama, which presumably would look different through someone else’s eyes.